IT WAS a few Sundays ago when I joined a group of artists and friends for lunch at a place that has to be on the must-see list of any Filipino art lover, especially those within driving range of Antipolo. We had been invited for lunch by Dr. Joven Cuanang, whose Pinto Art Museum we had visited once before, but this time it was the founder himself who was going to walk us around the place, so we all looked forward eagerly to meeting him and having a chat. For those who’ve never heard of it or never been there, the best way to describe the Pinto (people, including myself, have been heard pronouncing it as PIN-to, but it’s really Pin-TO as in “door”) is to call it an art complex—mostly gallery, but also museum, restaurant, theater, library, and, apparently, research center. It’s also, quite simply, just a lovely place to be, with its buildings and galleries set on seemingly terraced hillsides leading naturally from one to the other, offering spectacular panoramas of the metropolitan skyline from every high point. Not surprisingly, it can get very busy on weekends, with as many as a thousand visitors streaming in through the gate (admission fees range from about P100 to P200). After EDSA, Joven fell in with a committee of prominent Antipolo residents and community leaders eager to spearhead the town’s cultural renaissance, but the good doctor soon decided to go it alone after an unpleasant brush with government corruption. He must have seen art and nature as the best cleansing agents, and he began supporting a posse of local artists, buying their work when they needed cash. Those artists later became the Salingpusa group, which considers Pinto its physical and spiritual home. “We didn’t have much then so the artists first exhibited their work by hanging them on a clothesline, and that practice became known as Sampayan,” said Cuanang. As much as possible, Pinto’s buildings also employ natural ventilation, a notable exception being the air-conditioned library (where I was secretly pleased to find a couple of my books on the shelves). You’re never too far away from being reminded, however, that human whimsy is at work on Nature here, with oversized sculptures of mythological figures such as Icarus, Sisyphus, and Ariadne scattered about the greenery or soaring on rooftops. It’s refreshing and encouraging, in a way, not to see the usual parade of Amorsolos, Manansalas, Ocampos, and Botongs on display, and instead to find works by the likes of Elmer Borlongan, Jason Moss, Plet Bolipata, Tony Leaño, and Rodel Tapaya—at no diminution of quality, as these names could well be those of the National Artists of tomorrow. Salingpusa’s breathtaking 40 x 12-foot mural “Karnabal” is arguably the centerpiece of collection. What truly interests the Harvard-trained neurologist, who still practices medicine after serving for many years as medical director of St. Luke’s, is wholeness of mind, body, and spirit, which he hopes to promote through the Pinto Academy of Arts and Sciences, a complex of facilities in a corner of the compound that comprises a large indoor theater, an amphitheater, a library, a function room, open decks, and gardens. It’s a lot to think about, for sure—but there’s no better place to ponder the glorious if sometimes dark mysteries of the human imagination than Joven Cuanang’s hilltop sanctuary. Pinto Art Museum can be found on Sierra Madre Street in Grandheights Subdivision, Antipolo, and is open Tuesdays-Sundays, 9 am-6 pm. AS YOU read this, I’ll be winging home with my wife Beng from California where we’ve spent the past two weeks engaged in a pioneering project that should bring the best of Philippine art to a broader American audience, if ongoing plans work out over the next few years. Have you heard of the American Museum of Philippine Art? Probably not, since it’s still something of a pipe dream, but some people on both sides of the Pacific are blowing very hard on their pipes to make it happen. Those people include businessman Raffy Benitez, president of the Quezon City-based Erehwon Arts Center, and University of the Philippines professor and art expert Dr. Reuben Cañete, who developed the idea late last year after Erehwon’s successful involvement in a binational mural project at Chicago’s Field Museum sponsored by the John D. and Catherine T. MacArthur Foundation through Dr. Almira Astudillo-Gilles, a Chicago based Fil-Am writer and cultural advocate. I reported on that project in this column last November 25, noting the warm response received by the participating Filipino and Filipino-American artists for their works—two murals, one at Erehwon and another at the Field—depicting the flows of Philippine culture and history from pre-Hispanic times to the present. That positive experience encouraged Raffy and Reuben to conceive of a bigger and more enduring project that would bring Philippine art even closer to Americans—not just the huge and broadly dispersed Filipino community in the US, but the American public at large. 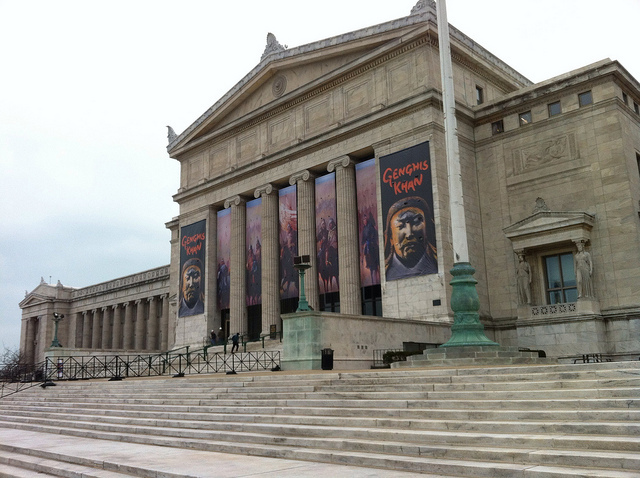 Raffy and Reuben noted that the Mexicans and the Chinese, among other immigrant groups in America, both had their art museums, but that Filipinos—among the largest and fastest-growing minorities in America—did not. Reuben recalled the long tradition of Filipino artists going over to the US to study and to work—such as Guillermo Tolentino, Victorio Edades, and Alfonso de Ossorio, among others—and observed that while strong cultural ties remained between the two countries, the connection was overwhelmingly one-way, with Philippine art (and music and literature, for that matter) being little known and appreciated in the US. “In this age of globalization, art is now a global commodity that is exhibited and collected by various international venues, such as Art Basel Miami. Philippine Art, both in its historical as well as contemporary manifestations, must now be aggressively promoted in the United States, which is a major area of collection and promotion of global art,” Dr. Cañete would say in a concept paper on AMPA. Karlota I. Contreras-Koterbay, a prizewinning Fil-Am sculptor and Director of the Slocumb Galleries at East Tennessee State University, agrees, writing that “There is a rich and dynamic art practice by Filipino-Americans in the US. However, there is a huge discrepancy in the visibility and recognition with regards to the idea and form of ‘Philippine Art’. To take the first steps toward turning vision into reality, Raffy, Reuben, Beng, and I flew to LA to meet up with some prominent Filipino-American community leaders and artists to set up a foundation that would start the spadework on the museum. The American Museum of Philippine Art Foundation, Inc. (AMPAFI) was formally launched July 12 at the Holiday Inn in Diamond Bar, California, in a day-long meeting attended by a couple of dozen participants from all over the US. Raffy Benitez will serve as chairman and president, and Reuben and I are joining him on the board, but we know that this project can’t be run from Manila, so the directors will also include art curator Karlota Contreras-Koterbay, physician Jose Botor Regullano, and engineer Ricardo Real Almonte. The officers include Fil-Am standouts Rafael Maniago, Art Zamora, Sal Budz Floriano, Rosie Vinluan Muñoz, Connie Buenaventura, Daniel Gutierrez Bassig, Dennis Martinez, Bobby Halili, Jess Española, Jun Sison, Ninette Tenza Umali, Ernan Ebreo, and Bernadette Escalona-Cooper. 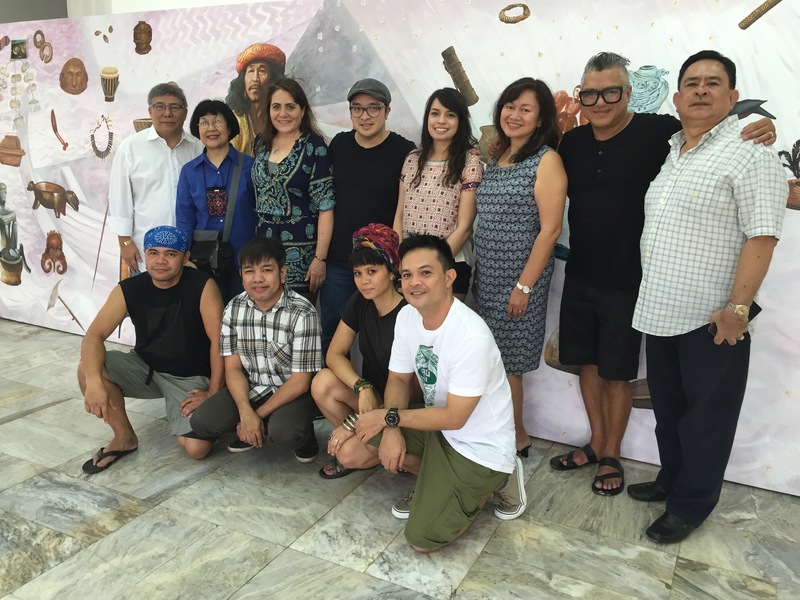 During the launch, a group of Fil-Am Artists headed by Paeng Maniago also rolled out a mural that they had executed to celebrate the occasion. We all realize that this project will take many years, enormous resources, and tremendous effort and optimism to realize. (Being Filipinos, we expect a lot of naysaying, and I’ve been Raffy’s chief buzzkiller whenever I think someone needs to pull his feet back to earth, but I have to admire the man’s guts and what he’s done at Erehwon, which you can preview here: http://erehwonartfoundation.org.) The museum as Raffy and Reuben envisage it is a mini-CCP, with enough spaces for exhibitions and performances (and even classes in Pinoy cooking), and the renowned architect Conrado Onglao was motivated and generous enough to contribute a prospective design for the building. That may be years down the road, but in the meanwhile, AMPAFI is taking early and doable steps toward building a countrywide arts community—a virtual museum, as it were—in cooperation with other groups such as Bernadette Escalona-Cooper’s Silicon Valley-based Global Artists’ Creative Collaboration for Empowerment (GACCE), whose leaders also attended the launch. The AMPA website is up at http://www.ampafi.org. Contributions and donations are, of course, very welcome, but more than that, we need goodwill, prayers, and strength of spirit to see this vision through. Mabuhay at salamat sa lahat!